Protect against roof damage, soil erosion, and basement flooding with the right gutter system for your home. No roofing systems, no matter how good the material, can adequately keep your home safe without quality gutters & downspouts. 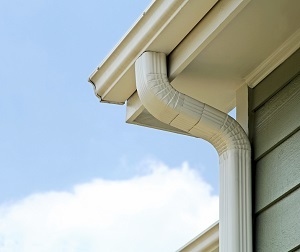 By redirecting water away from your home gutters & downspouts prevent water damage to the roof and siding while also helping to prevent basement flooding. If your gutters are damaged or frequently clog then your whole exterior is at risk. Overflow from your gutters can greatly damage your siding, roof, and even interior in the form of basement flooding. Luckily, the experts at Infinity Home Improvement are here to help. 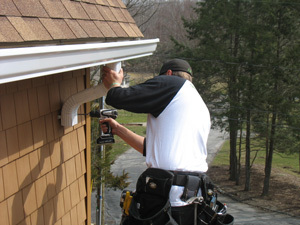 Our team provides a wide range of gutter services including gutter repair, gutter installation, and even gutter guards. If you're interested in new gutters for your home, need repairs, or just want gutter guards to help you never have to clean your gutters again, then Infinity Home Improvement has you covered. Give us a call at 1-844-329-3277 or click below to schedule your free estimate in Wyoming, Kentwood, Grand Rapids, and the surrounding areas of Southern Michigan! "I've had the gutter helmet for several years and have been..."
"My son and daughter in-law were amazed at the work you did..."
"Very good service. The gutters look great. Sam..."
Get the perfect gutters for your home's needs and style. Truss Building Products, LLC is a Texas manufacturer and distributor of specialty gutter products sold throughout the nation. They offer products designed for all types of homes and buildings from single family to multi-family and commercial buildings. The SnapLock Gutter System® provides a superior gutter solution to traditional options. While traditional options have historically relied on nails, screws, and spikes for attachment, this puts them at risk for structural later down the line due to rot, mold, and other environmental factors. Whether you need gutter installation, gutter replacement, gutter repair, or simply gutter guards, the experts at Infinity Home Improvement are here to help. Our experienced crew can help you choose the right service for your needs and provide the quality gutter materials that you need to keep your home protected for years to come. Contact us today online or give us a call at 1-844-329-3277 to schedule your free estimate. We provide all our gutter services to Wyoming, Kentwood, Grand Rapids, Allendale, Holland, Walkerville, Battle Creek, Lansing, Kalamazoo, Rockford, and throughout nearby MI and IL!